HTTP/2 is on its way to mainstream adoption, and today developers at the Velocity Conference in New York got a glimpse of what that means for the future of web performance. 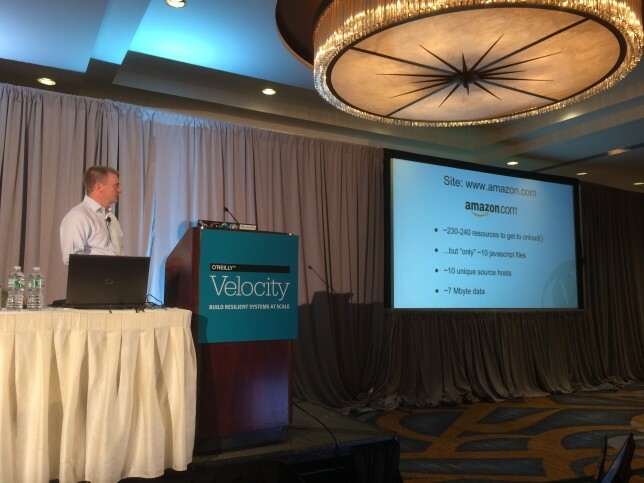 In a special session at Velocity, Load Impact founder Ragnar Lönn and Internet Engineering Task Force (IETF) contributor Daniel Stenberg unveiled “HTTP/2 vs. HTTP/1.1: A Performance Analysis,” a tool that developers can use to see the difference in how their websites will perform on HTTP/2. “There really is no downside to developing a website optimized for HTTP/2,” said Lönn. “The likely worst case scenario for your HTTP/1 website is that performance will stay the same for right now." Internet users can expect websites optimized for and delivered over HTTP/2 to perform 50-70 percent better than sites over HTTP/1.1 — a stat that drew something close to a gasp from the Velocity crowd. The slides from Lönn and Stenberg's presentation can be found above and on Slideshare. Lönn and Stenberg presented to around 300 people at the Hilton in midtown Manhattan, where they laid out the research from their nearly year-long study on HTTP/2, including insights from Stenberg’s time with the IETF. Stenberg was a key contributor to the HTTPbis working group within the IETF during the HTTP/2 project. “HTTP/2 is one of the most significant updates to the web since its development as a whole,” said Stenberg. “I think it’s very important for developers to understand how HTTP/2 will change the Internet forever, and this project helps make that clear." Load Impact is obsessed with all things web performance, and we’ll be continuing to monitor the adoption of HTTP/2 and improving our HTTP/2 vs. HTTP/1.1 application. In the meantime, Velocity attendees and performance enthusiasts around NYC can catch up with us at our HTTP/2-focused meetup Thursday for more insights — plus free beer, pizza and T-shirts.